Whilst researching the history of Thirlmere I came across some photographs made prior to the building of the dam, and therefore before the major flooding that created the reservoir. 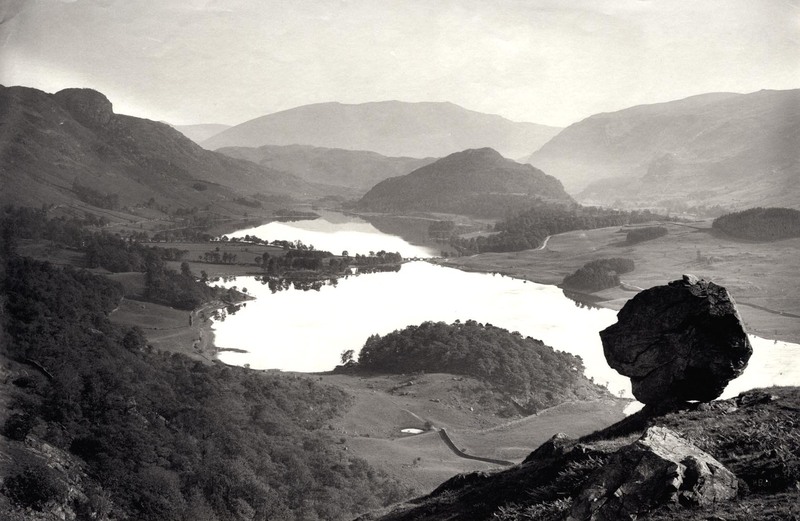 One of the best photographs of the period is by Herbert Bell from Ambleside (I assume no relation) which shows this large stone teetering, seemingly miraculously, over Thirlmere near to Launchy Gill. The older photographs refer to this as the Rocking Stone, more recently it is also known as the Tottling Stone. Nowadays the view is, as is the case all around Thirlmere, obscured by tall trees – the trees help to stop land erosion on the steep banks into the drinking water below, hence their relative profusion. On a summer’s evening, in the right light, the view through the trees is one of the finest in the Lake District. I’ve no idea how long this stone has remained in this position but I do hope for a long time to come.